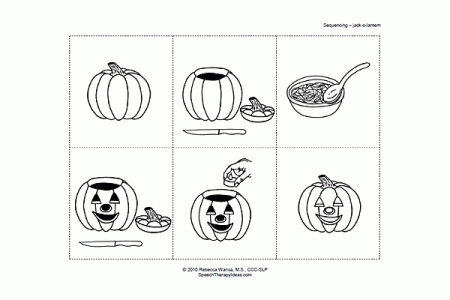 You are here: Home / Resources / Fall / Carving a Pumpkin – Make it a Speech and Language Activity! Carving a Pumpkin – Make it a Speech and Language Activity! One of my favorite Halloween memories from childhood is carving pumpkins with my dad. I loved the excitement of picking them out, pulling out all the yucky guts, deciding on faces, lighting them up and then, of course, making pumpkin seeds. With Halloween right around corner, it’s a great time to carve some pumpkins and make memories with your kids. Below are 3 ways you can work speech and language goals into this fun holiday activity! about size concepts as well as to compare and contrast. Have your child find the biggest or smallest pumpkin. After picking out your pumpkins, have your child put them in order from biggest to smallest (or vice versa). Compare the sizes and shapes of the pumpkins. 2. Carving the pumpkin. But first, talk about how you’re going to do it. Make “How to Carve a Pumpkin” directions and problem solve with your child about what’s going to happen first, next, and last. They can draw or write out the steps. If your child is younger, use one of these sequencing activities to help with the sequencing! 3. Making pumpkin seeds. Cooking and recipes are great ways to work on language comprehension, vocabulary, and sequencing skills. Click here for a great recipe – it gives you different seasoning options. Have your child recall all the steps of the recipe. It might be helpful to draw, or write them out. Talk about the different seasoning options and how they might taste; use descriptive vocabulary words to describe the flavors! Spicy, fiery, zesty, sweet, fragrant, etc. Click here for 5 more speech and language themed Halloween activities! https://nspt4kids.com/wp-content/uploads/2014/10/family-carving-pumpkin.jpg 508 337 Jessica Jamicich https://nspt4kids.com/wp-content/uploads/2016/05/nspt_2-color-logo_noclaims.png Jessica Jamicich2014-10-20 14:15:122014-10-20 14:15:12Carving a Pumpkin – Make it a Speech and Language Activity!